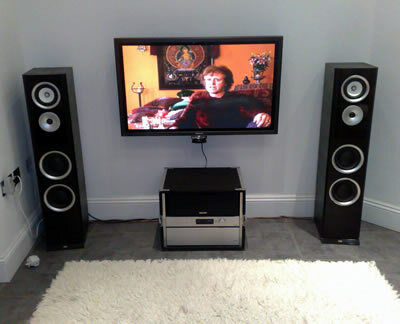 I am trying out a 'High-End' Audiolab 7.1 Surround Sound system (In 5.1 mode) in my sitting room.. Audiolab 8000AV (Processor) / 800X7 (7 x 100 watt amp) Tannoy Centre Speaker, Logic 3 rear's (which my very kind pal, Richard (Jax) Jackson kindly gave me!) With a view to doing some 5.1 mixes in Cubase. I'm not a great lover of HiFi, either 'Hi End' like this £3000 Audiolab system or any other type really.. The fact that HiFi manufacturers still use unbalanced Phono connectors speaks volumes to those who know... However, apart from some 'Zipper' noise from the digital volume control and some amplifier hiss, this system is quite pleasant to listen to in the home. Our home entertainment system is based around Microsoft's Media Center (American spelling!). Which we have used since version 1. And apart from burning out a few hard drives the system has worked reasonably well for many years. The same PC is also our file / print server, home automation, backup home security system. It also used to be our web server but now we have a dedicated LAMP Box 'Air One'. When I updated my studio computer I discovered that the Asus M4A78T-E mother board would not fit in the new 3u rack case. So I had to get another board (AsusM4A88TD-V-EVO-USB3) and as I now had a spare DDR3 motherboard I decided to re-build the Media center PC. I added an Asus AMD Quad Core, 4 gig of DDR3 ram, 650 watt PSU.. The connection from the PC to the Audiolab Processor is via optical S/PDIF. This proved to be very complicated to get working correctly on Windows 7, 'Pass Through' mode etc, etc..